Serious and generous, but a bit shy, Yuudai has been unsuccessful with the opposite gender. Chizuru is an energetic and cheerful girl, but when it comes to boyfriends, she's been unlucky and clumsy, and never had a steady relationship. This is the first Christmas the couple spends together. Chizuru loves animals and Yuudai plans to give her a rabbit in a box, but it turns out to be... a mini donkey?! As the funny creature escapes, Chizuru goes after it, and Yuudai loses sight of them both! Yuudai and Chizuru—their feelings and the time they spent far from each other are delicately unfolded in this double-sided pure love story told from two different perspectives! This is one of the most unique anime experiences I have ever encountered. This should way of story telling should be done more often. Especially for love stories like this one. Tokyo Marble is basically a two episode ova about two I'll unlucky lovers who never seem to catch a break. One episode tells the girlfriends point of view and the other episode tells the boyfriend's point of view. But heres what makes this so great: both episodes are interchangeable. You can watch one and notice little details that the other OVA purposely leaves in or out. It's such a great mind trip because you actually feel like your experiencing what they're dealing with. Its almost really sad but the whole experience is just amazing that one has to watch it to truly understand how amazing just watching two episodes can be. The romance story would have been perfect in my opinion with the exception of one thing... a MINI DONKEY im not going to spoil the purpose of why its in the story but suffice to say it would have been just fine using a cat or a dog or even a friggin monkey. The story was so good that one could even overlook the &quot;unique&quot; style of the show and how they like to draw the main characters with monkey like features (you'll see what i mean when you watch it). I may not agree with what they decided on how the characters look like, but the artwork does give out that warm love story feeling. Most of the background is lightly penciled in and touched up with light or warm colored water colors. Everything looks like where it should be (except for the donkey). I know some anime series have done this method for a couple episodes but it didn't feel the same as how Tokyo Marble executed it. I cant stress enough how great this show was... I've watched it both episodes 3 times already. 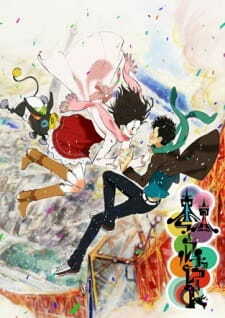 Excellent storytelling and a wonderful anime to watch with a loved one, but please lose the donkey. Wonderful!!! Everything about it was so cute and heartwarming that I can&rsquo;t express enough how it touched me. It does stay true to the whole &quot;romance&quot; theme, all the while adding in unique twists and misunderstandings that come with it. What really stood out for me the most was the fact that you get to experience it from both the male and female&rsquo;s view point of the story. So while you get to see what one of them was doing during that day, you then get to see it from the others point of view on the next episode, and this is important as the overall plot and misunderstands can&rsquo;t be understood until you have done so. Truly you can feel the pain and the love that these two share, and can't help but be drawn in by them, as they get put in most inconvenient of situations which stall their confessions for one another. While it does keep everything realistic for the most part, it also includes this somewhat exaggerated miniature Donkey character that may seem a bit out of place with the overall concept of the otherwise down to earth storyline. (which in truth....yeah it was, and just seems down right silly. Though I won't ruin the role he plays for you) Surprisingly though it worked out great, and he only adds to the entertainment of it. Its an overall calm title (at least the parts that don&rsquo;t include the Donkey) and really draws you in the moment it starts. As the character&rsquo;s start talking about their pasts, and right at that point you know what to expect. Though I feel I should warn some out there, that the storyline is very discrete, so if your wanting a more gushy style of love story (the characters never even kiss) you certainly won&rsquo;t find it here. My only real complaint with the story was, you never really learn just why this was called &quot;Tokyo Marble Chocolate&quot; until the very very end. (as in the last few seconds of episode two's credits. Which seemed kind of odd to me. There is really no offensive material in this, with the exception of one scene where the main female is dressing at the beginning. So you get to see a short view of her underwear from the back. Nothing too much, but just be aware that it&rsquo;s there. It works well enough, and I did like the soft textured art that came with it, which indeed give the characters a more lite comic book style of art. I know that&rsquo;s what they were shooting for when they made this, and feel they succeed well with it. Unfortunately it also gives the picture a somewhat bland look to it, this is especially true with the backgrounds. As there are some occasions where they barley detail any of the city. Kind of hit and miss, sometimes they detail it and well other times they don&rsquo;t. The characters do move fluidly enough, and expect to see quite a bit of running to take place. The artwork does work out if you can appreciate it&rsquo;s direction in art, but it&rsquo;s nothing really too special from a technical stand point. Very very suttle, its basically different soft piano tracks that play throughout most of it. It&rsquo;s good to fit the lite downtown romance beat and all, I just couldn&rsquo;t really find a track that stood out for me amongst the others. Though you do get a more uppity beat that plays in the end of the story ark, sung by a male vocalist. The voice acting I must was was spot on, though you only get a minimal variety of voice actors in this, most of which come from the two main leads, they both fit quite well with their personalities and I feel they really did mesh well with them. But again, quite minimal. They are so believable in their roles that you just can&rsquo;t help but root for them the whole way through. They really give off a good appeal to the audience and never come off as exaggerated. Even the some what clumsy male never got on my nerves. Which says a lot for me, as a majority tend to do. The couple just give you that certain appeal of what it&rsquo;s like when a relationship may take a 180 from where you would otherwise want it to be. Again I should mention that you sadly only get a small cast in this, and all other characters are only on screen for a minute or two. I really enjoyed this title, much more than I actually thought I would. If watching a gently love anime doesn&rsquo;t really sound that appealing, then you probably should just scratch Tokyo Marble Chocolate off your list. Since it stays true to the lite romance formula and may be too discrete for some. However, if your looking for one of the more memorable ones out there, then this title was made for you! This will be a short review; I did not want to but after watching it, I had to write one. The story was short yet each scene was impactful. Though clichéd, every misunderstanding and accident was a succinct representation of the things that can go wrong in a relationship. The delivery method of separately showing each perspective of the couple was a refreshing change compared to the traditional methods. Due to the nature of the story and its short length, it is hard to describe the characters without revealing the plot. What I can say is that they are an average couple in love under not so average circumstances. This however does not diminish the story but complements its slightly bizarre plot and third character. The hand-drawn watercolor art was warm and calm. The short instrumental pieces that accompanied each scene were a delight to the ears. The ending songs were bittersweet. Overall, it was great. But I gave it a 7. I wanted to give it an 8 or even a 9. But I couldn't do it. Because I didn't hear what I waited two episodes to hear. I replayed the scene(s) over and over and I strained my ears, but I just couldn't hear it. I had to imagine that it was spoken; that his mouth moved under the falling snow. But this was hardly a good replacement for the spoken phrase. And this was after it spent two episodes emphasizing its importance. And despite the pictures in the ending credits, I didn't get the closure that I sought. And this was when it hit me. By not saying it, I got to feel what she probably felt all that time; that nagging feeling, the unease and sense of loss. Thus, I learnt a valuable lesson. Then I gave it a 9. Spend a day or two with the weirdest creature you will see, all in the midst of your boyfriend/girlfriend problems. Anyone? Tokyo Marble Chocolate is a two-part OVA that tells the story of Chizuru and Yuudai - unlike any other. It is their love story, seen through different eyes; first from the girl, then from the guy. Still, you can watch it any way you want: the episodes are interchangeable! The two sides of this couple both got issues. Every single one of Chizuru's previous relationships were a failure, and she begins to question some of her insecurities. Yuudai is no better. Heck, one of his past girlfriends had more manly guts than he will ever have. Even so, they try to be in love again, and try, and try, and try some more - all the while burdened by their past mistakes. When they both decide one day that they'd individually do something that will bring a lot of changes on their lives, something enters the picture - wait, what the hell? A nappy-wearing, punk-looking, mischievous mini-donkey? Wow, then begins a touching run of love, understanding and hope. If you're more of a reality-based romance fan, don't be put off by the 'fantasy' aspect you will see in this. The only fantasy-based thing in this show is the mini-donkey, for the fact that you won't see multi-colored animals roaming around the city wearing diapers in real life. Anyway, he/she's there for a reason; I suggest you not to look at him/her literally. I think he represents a feeling that we always seek - runs away, sometimes protective, always unpredictable, the feeling that could never hide the truth. And, yeap, it starts with the letter L.
Both episodes tell the same story, from different perspectives, and people tend to pick one over the other. I am personally fond of Chizuru's part more, mainly because her ending was more well-executed: the song was awesome. With that, I can tell you that the music of this anime was good, and it worked. Yuudai's half of the OVA can stand its ground. Also, I liked the designs of the show; how the characters showed emotion, the sketchy background, bravo. About half the time you will spend watching this, you'll see them running, especially true for Yuudai. Run away from something, run towards something. Yes, they're young, and the future isn't happily custom-made for them, but they push through, in spite of uncertainty, which is more than I can say for some older people. Don't be afraid to chase. After all, isn't love worth chasing for?